how I had wired it up. There answer yup that sounds right. Flipped the switch nothing. Switched a wire around and it fired right up. What a pretty sound lol. All in all I’m very p!eased with the entire purchase from sale to delivery . Looks like a great saw. I wanted a Jet but couldn’t afford one. Got a Grizzly instead. I am happy with the Grizzly. I hope you and your Jet saw have many years of enjoyment together. Congratulations, Nice Saw. I have been looking at table saws myself. Looks like I am going to have to live with my Ridgid R4512 saw for a couple more years. Have been considering putting a better fence on it. Reading your review, I see you put a vega fence on the same saw I already have. Was it worth it? Debating with myself on spending the money on it, or living with the factory fence. Leaning in the direction of a sawstop. 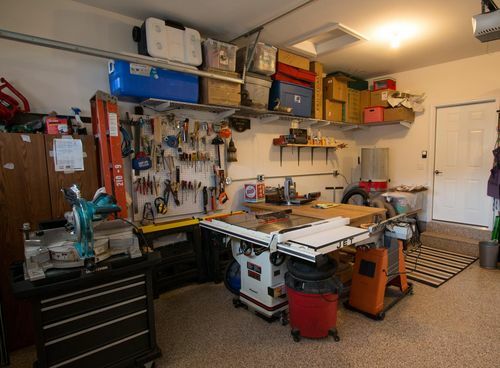 But made two big tool purchases in one year. 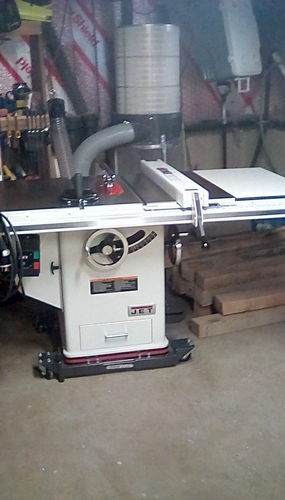 (Griilzy bandsaw, and a Jet lathe) Got to put brakes on tool spending for awhile. I have that Ridgid saw tuned up nice, but the fence is always a pain to keep adjusted. I think the fence upgrade was worth it as far as the trunion i just squared it up to the height of the stock i used most. I bought my fence used craiglst but would have paid full price. You’ll enjoy this saw. I have the same saw for over a year now and it is a pleasure to use. Big congrats on the new saw. I know that having a really nice saw sitting in the shop for ready use is a huge physical and work-related equipment improvement. And for me it is also a very nice, mental and emotional, positive aspect of the whole shop experience. What mobile base is on your new saw, please? I can’t identify that one, and it does not look like the ones that are offered on the Jet Tools website. Thanks, and enjoy the saw. Congrats! 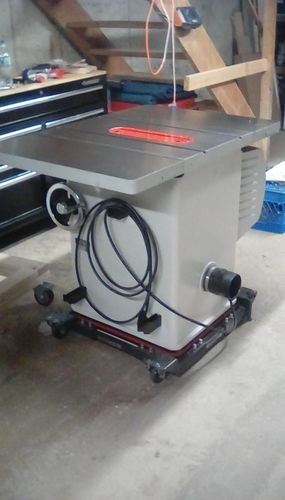 I have the same saw on the Jet mobile base and also bought it when they ran their 15% off sale. Mine came delivered to my house in the same excellent packaging and the driver kindly wheeled it into my shop. I’m going on 5 years now and its run flawlessly. Only thing extra I needed to buy for it was a low profile riving knife for non thru cuts. I have the 3hp version and never needed more power. Mine only needed the fence to be tweaked slightly for the way I like it to glide. You’re gonna love this saw and the dust collection from the blade shroud works great. Haha, I think I remember looking at the wiring diagram and noticed the discrepancy when I looked at the color coding in the junction box and went with the actual color coding as it was correct and made sense for a 220 hookup. Commercial shops often use 440 3 phase and might explain the discrepancy.